Named by Forbes as the world’s most inventive city, Eindhoven has defined itself a a hub of innovation and creativity, hitting the headlines repeatedly in recent years. One such example of Eindhoven ingenuity is Stella, a solar-powered family car designed to travel over 1,000 kilometres on a single charge. Stella was created by Solar Team Eindhoven, who believe that electrical mobility is the future and that their mobility platform will transform society tremendously. Founded in 2013, the all-student led team, competed in and won in the World Solar Challenge 2013, and will return to this year's event to defend their title with a recently unveiled and newly updated version, the Stella Lux. The vehicle is in fact so efficient, it actually generates more energy than it consumes, which can be fed back into the energy grid and have a beneficial impact on society. A truly intelligent car, Stella Lux has a smart geolocation system, collects environmental data, and connects to other cars and smartphones to create a carefree, energy-efficient experience. We caught up with Lex Hoefsloot, co-Founder of Solar Team Eindhoven, who will be speaking at the Future Technology Summit in London this week, to hear more about how their project began and what we can expect next. Can you tell us about Solar Team Eindhoven and why it started. Solar Team Eindhoven started because we noticed the huge gap between comfortable, practical but short-range electric cars and extremely efficient long-range but impractical solar cars. We knew there was a perfect combination of the two, we did the math and decided to take the plunge. We assembled 20 students that all quit their studies for a year to build the car, competed in the World Solar Challenge 2013 and won the cruiser class. By driving 3000 kilometers throughout the outback you make a statement that this is not just another prototype, but a car that can handle harsh conditions and perform at high speeds. What are the key factors that have enabled recent progress in solar powered vehicles? The steps that are made within all technologies we use: more efficient solar cells, lighter constructions, higher capacity batteries and more efficient motors. All these incremental steps eventually lead to breakthroughs. You just have to wait for them. What are the challenges to getting solar powered cars into mainstream use? The challenge is to let people get used to a new kind of car. A car that is just as safe if not safer and just as comfortable as the car they are used to. It just looks different and is two to three times lighter. The technology isn’t the problem, it’s the perception of people. People tend to choose for known or conventional option even though there are better options available. What developments can we expect to see in solar powered cars in the next 5 years? The shift to fully production ready solar cars. As technologies keep improving, solar cars can become more ‘beefy’ and be equipped with all luxury people are used to. Solar cars might be available in the showroom within 5 to 10 years. Which areas do you feel could benefit from cross-industry collaboration in your work? Cross industry collaboration in automotive is vital. The lightweight materials are a product from the aviation industry, batteries from the smartphone and laptop industry and of course solar cells come from a totally different sector. All these technologies make up a solar car and came from outside the automotive sector. Also autonomous driving, that which plays and important role in the coming years finds in origin in artificial intelligence, robotics and the chip industry. The whole system is changing. The energy source (oil to solar), the way we use cars (uber, car sharing), the way we drive cars (autonomous driving) and the way cars are build (3D printing, carbon fiber, cars connected to their factory). Revolutionary products have the change to redesign all these aspects at once. 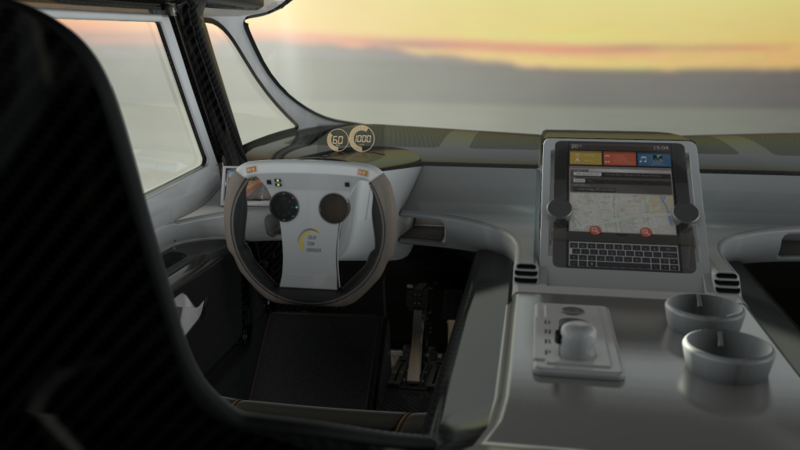 Autonomous solar powered vehicles can be a option for a whole range of opportunities. Lex Hoefsloot will be speaking on Day 2 of the Future Technology Summit in London, 24-25 September. Other energy-focused speakers and exhibitors include Daniel Becerra, Buffalo Grid; Jonathan Keeling, Pavegen; and Luca Gammaitoni, University of Perugia. View the agenda here. The Future Technology Summit is taking place alongside the Deep Learning Summit. For more information and to register, please visit the event website here.